The Khmer Rouge war crimes tribunal does not have sufficient funds to pay reparations to war crimes victims as stipulated in the event of a guilty verdict in the current Case 002, the Open Society Foundations said Wednesday. With the Khmer middle class's growing taste for fine wine—a relatively new profession has sprung up in Cambodia—that of sommelier. And, for the first time this month, two Cambodian sommeliers are taking part in a regional contest in Singapore. 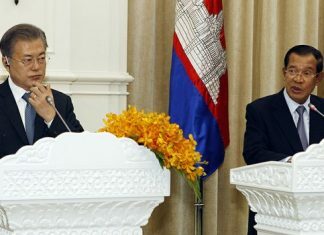 Cambodia National Rescue Party president Sam Rainsy said Monday that the opposition has rejected the results of Sunday’s election, and called for an independent investigation of the vote to determine if a re-election is required. The lead archaeologist behind a project in Siem Reap studying medieval ruins around Kulen mountain on Sunday sought to clarify international media coverage proclaiming the “discovery” of a lost city in the area, as researchers have known about the existence of the centuries-old city for decades. So far, in the run-up to July’s national election, the main issues of inter-party contention have not been the country’s struggling health system, under-funded education sector, poverty reduction, job creation or the ever-present cost of corruption. Rather, the debate has lurched back to old narratives: Who is a Vietnamese puppet? Who is a terrorist? Who loves the monarchy more? And, who saved the country, or caused its destruction, in the 1970s? Following ancient tradition, the royal oxen are allowed to choose from a buffet of rice, corn, beans, sesame seeds, freshly cut grass, water and rice wine to predict the upcoming harvest. But it seems the royal oxen simply have a taste for corn. Dressed in the trademark black pajamas of the Khmer Rouge regime, wild-eyed young soldiers armed with AK-47 rifles drive the population out of Phnom Penh: a pregnant woman, a sickly old man on a drip, children. None are spared and many are later brutally massacred. ($) Sotheby’s has denied having “any knowledge” that a 10th-century Khmer statue in its possession—which the U.S. government has taken the auction house to court over in an effort to return it to Cambodia—was stolen from the Koh Ker temple complex in Preah Vihear province. Cambodia’s lawsuit against auction house Sotheby’s over a 10th century sandstone statue has been given the go-ahead by a U.S. judge who on Thursday denied Sotheby’s motion to dismiss the case. A 25-year-old Frenchman died Friday of a heart attack while taking part in the filming of a “Survivor”-style reality television show on Koh Rong, located about 30 km off the coast of Preah Sihanouk province, officials said. Ieng Sary, one of the principal leaders of the Khmer Rouge regime, who died last week in the middle of a war crimes trial in which he and two others were accused of genocide, was cremated Thursday.